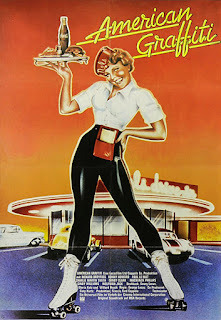 When I watched American Graffiti at first, I thought the film was pretty good; I didn’t think it was a spectacle, or a big blockbuster, just pretty good. But then I had a conversation with Steve that made me realise that this film was so great for those that grew up with it, those that grew up going out with different people and having all the problems that are experienced by the characters on screen, because it was relatable their own real lives. The fact that the teenagers in the film still make the best out of a bad night really tells you that the best thing you can do in any situation like that is make the best of it and keep pushing to make that night as good as you can make it. I didn’t see the film this way as I haven’t experienced the girlfriend issues that the characters in this film experience. But I have experienced difficulties in life like everyone does, nobody can have the perfect life. Even if you have all the money in the world or are a care free teenager going to a big university next year, you still have to deal with the burdens that come with that. There is a certain character in this film, Ron Howard’s character, Steve Bolander, that has a nice fancy car, but still experiences issues with his girlfriend, and he has to deal with that and learn to treat her better and understand her point of view. But the film doesn’t just teach people to keep trying as more problems come your way, but they also encourage confidence in people, the teenager that everyone seems to think little of, the one they refer to as “Toad”, played by Charles Martin Smith, learns in this film to be more confident in himself by meeting a girl and offering to give her a lift in his newly gifted car, and do various fun activities, such as finding a way to get alcohol at their age. He gains more confidence through the car but, even after he loses the car again when he gives it back to his friend, the girl still wants to go out and have fun with him, because he showed confidence and, as a result, they had an enjoyable time and it didn’t matter what car he had. Curt (Richard Dreyfuss), in particular, experiences a number issues throughout the night, from having to hitch a ride in the back of a number of vehicles along with his friends and their partners, the fact that he keeps missing the chance to talk with the mysterious blonde he keeps seeing/hearing, and how he ends up having to do loads of different things for this gang called the “Pharaohs”. But Curt goes through this night hopeful that he will eventually find this girl, and he also keeps doing what the Pharaohs ask until it pays off when they say he can be in their gang but is leaving anyway. He also benefits from this night, because he comes across a number of people that either urge him to stay or to leave. But, after being told by enough people that going out to explore the world is the best way to get the most out of life, he decides to leave and misses the chance to be with this mysterious girl, but despite all these misfortunes, he ends up being a successful writer living in Canada. It’s through all the events of the night that I believe he gained confidence in himself to leave to go to college. It took confidence for him to do that, because he still had unfinished business in his home town, the mysterious girl that he kept seeing, but he chose to believe in the fact that he will eventually find this girl again if she really is the one, or find the one that’s really for him, someday, but he still needs to have the confidence to take an opportunity when its presented to him. He is the only one that chooses to do so and, because of this confidence, he ends up being the successful writer. I also found it quite interesting that one of these characters, Carol (played by Mackenzie Phillips), is treated so badly, by her parents (according to her) and now by John Milner (Paul Le Mat), the guy who wanted one of the girls he meets in a car but ended up getting the younger girl, who had no interest in being involved with. It’s notable that everyone seems to treat this Carol horribly because of her looks, because it kind of shows what life was like back then if you were born with unappealing traits to some. But that’s almost a horrible thought that someone could be mistreated, even by their parents, simply because of how they looked, and really makes me glad that things have changed, and a lot fewer parents are like that and love their children even if they don’t look like the “beautiful blonde” that is often portrayed as the more attractive of both genders in the media, probably more so at the time. But this film does represent that you can learn to have fun with someone who may not be physically attractive in your eyes, it shows that you can be attracted to them in a fun and friendly manner, which is shown when John and Carol both spray the car of people that throw a water balloon and John, seemingly just because of the car he drives. The same is true with “Toad”, people call him as such and play pranks on him such as by pulling his trousers down. And that’s kind of shown on the flip side with the girl that Toad meets, who is clearly constantly flirted with by guys, with one of them trying to get her to come with them when Toad is already with her having a good time. Nowadays it’s kind of changed, because the years that I went to school, it was all about being the funny one, or having something that makes everyone like you, and if you didn’t have that, you were the victim of the jokes/pranks. So, it was less about appearance and more about being fun to be around, it’s good that things have changed in that regard but unfortunately, I don’t believe it will ever change that there won’t be anyone who has to be made fun of during school years. It’s also interesting in this film, that it seems to follow the premise that every guy needs to find this “perfectly beautiful girl” for them, which is still relevant to us nowadays, but now it seems more about finding a person who is beautiful on the inside rather than the outside, so it’s interesting to see how people back then thought. Of course, there’s also the fact that they are young adults at this point in the film so they may not have realised it at this point. There also seems to be a male dominance shown in this film, through characters such as Steve Bolander, who seems to be a little controlling over Laurie at times in this film such as when he tells her that she wants to dance and she then refuses to because she feels annoyed at him for suggesting that they see other people whilst he is away. It’s interesting, because they both seem to have different opinions on how their relationship works, Steve seems to believe that its some kind of casual relationship that can only be serious if he can be sure that she is the girl for him (which almost sounds like an excuse to see other people whilst he is away), whereas Laurie seems to care about him too much to want to see other people or have him leave in general. It’s things like this that almost make me think about how females were treated in society at this time in America, the fact that Steve believes that she’d be okay with him seeing other girls almost makes you think that this is a common thing and that relationships weren’t as evenly balanced as they are nowadays. To be honest, this film does a great job of showing what life was like for a young adult growing up in the early 1960s, showing how people treated each other whilst also giving across the positive message that it shouldn’t matter what you look like, which is clear when you see that Terry (“Toad”), gets together with the beautiful Debbie (Played by Candy Clark). It’s also shown when Carol ends up becoming pretty good friends with John, which also kind of helps to show that boys and girls can be just friends, at the time, and even nowadays as some people still don’t believe it’s possible. It’s all these positive themes that make this film perfect for anyone to watch who believes that they are out of the league of someone else because they aren’t as “good looking” as they are, but all you really need is the confidence, that this film really brings across in a great way. It’s also a great film that played on nostalgia for those that grew up in the 50s-60s as it had the whole rock and roll vibe to it, which is what made it a big success in its time, as the film came out in 1973. The issues that these characters face were extremely relatable to those that grew up in these times also, and it’s this that made the film feel authentic to those that grew up with it. This relatability is what makes it still a great film to watch nowadays and, after thinking more and writing more about it, I personally like the film a whole lot more for it too.